Junk Works Halifax is a family owned business. The franchise was purchased by Chris and Sherry Willison. The general manager is their son, Andrew. He set the business up and runs it. Their Halifax Junk Removal business takes what most people consider junk and gives it new life. Chris, the father, advised businesses as a lawyer for years. He wanted to have an opportunity to run his own business. Junk Works gave him a turn-key solution to running a business in a client focused manner. He wanted to deliver excellent client service day in and day out, and operate an environmentally responsible operation. Andrew saw a unique opportunity to set up and run a business from the start. He states, “it is a good way to learn about business and a great way to interact with people. The process begins with their biodiesel-fueled transport truck that carries five to six tons of material. This sized truck helps remove large or multiple pieces of furniture from apartments or multiple items from businesses. It is often difficult for customers to reclaim their space. They do not have the time or the ability to remove items like big televisions, appliances, refrigerator/freezers, e-waste, yard waste, hot tubs, fencing, or wood. Some people want the job done the same day but want the items disposed of responsibly and reused, recycled, or re-purposed whenever possible. Andrew and his crew take the junk back to their warehouse and sort through the gems they collect. Some of it, like a burnout refrigerator, is unusable and will be recycled. Other items, like children’s toys and clothes, will be donated to charities like the Salvation Army and Beacon Hill. Andrew says, “it is not your typical job but meeting the clients and talking to them is fun. He further adds, “because we are recycling and we have a spot we can take the haul to, we are minimizing what we take to the landfill. If you are looking to have junk removed from your property at a reasonable rate, call Junk Works Halifax at 1-888-888-5865 (JUNK) or book online. 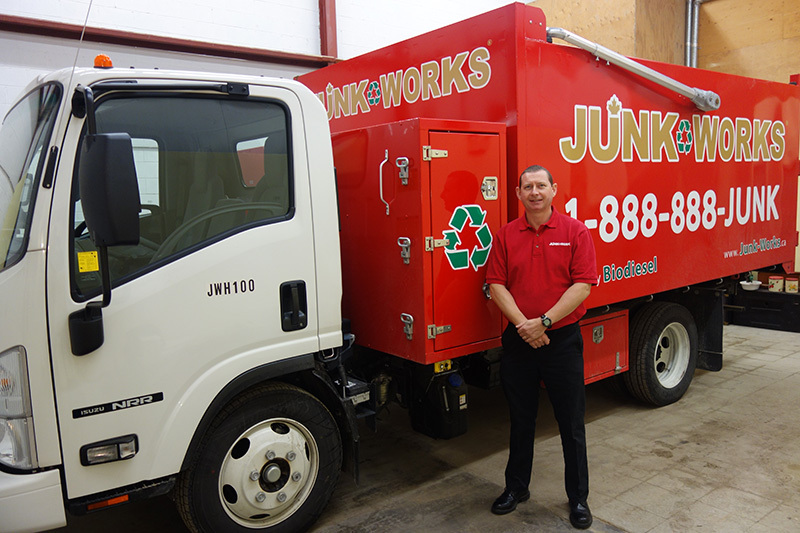 Junk Works™ provides trusted junk hauling services in the Halifax area. Our professional staff can be in the Halifax area in minutes, and provide junk pickup quickly! You can have piece of mind knowing that your items are disposed of properly since we recycle up to 60% of all items we pick up. April 24, 2019 by A.M. The gentlemen who game were excellent hard workers. The whole event took 45 min. Also they arrived on time. April 14, 2019 by L.S. April 12, 2019 by S.H. Very helpful and very nice young men doing the work. April 04, 2019 by G.E. Fast and reasonable cost. Cody and Jonathan were very helpful.